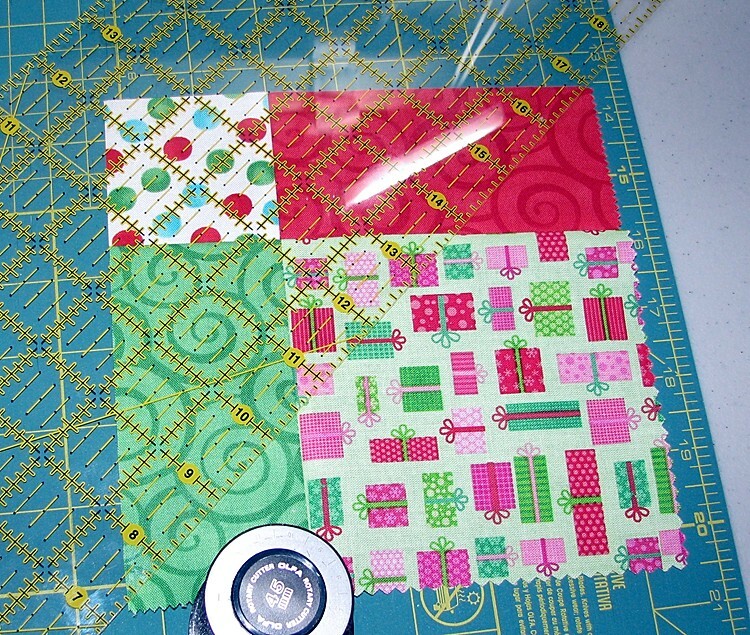 I realized I did not sew and show the block the way I originally intended when I wrote this tutorial! So I updated it with some new pictures and text. 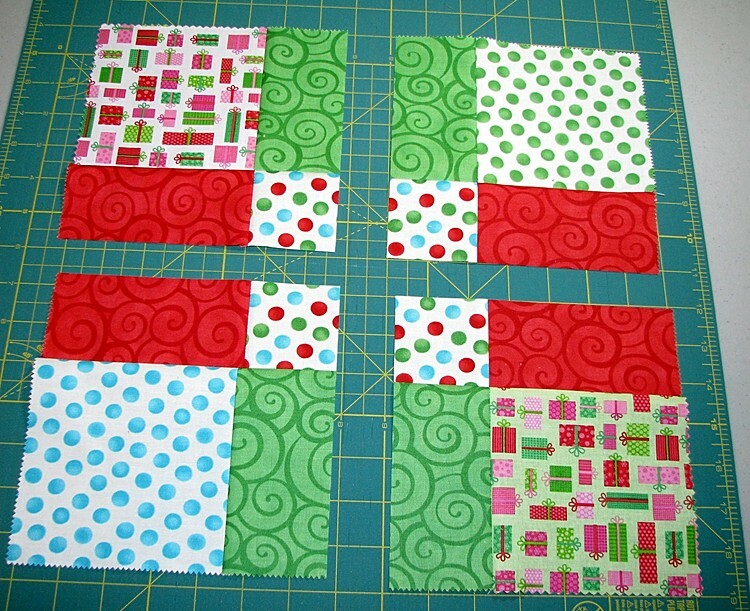 I started with a Charm Pack (pre-cut 5 1/2 inch squares) and made a nine patch block. To end up with the green and red partial “frames” around the block, it’s important that you lay your colors out as pictured here. I then cut this block in half vertically down the center, then horizontally across the center. To find your centers line up your ruler with the 2 1/4 inch mark running along the left seam vertically, make your cut, then without moving the block, switch your ruler to horizontal with the 2 1/4 inch mark running along the horizontal seam (as pictured above) and make that cut. You now have four squares. The bottom left square should be cut from the right lower corner up to the left top corner as pictured below. The bottom right square should be cut diagonally from the left bottom corner up to the right top corner as pictured below. The top left square should be cut diagonally from the left bottom corner to the right top corner as pictured below. The right top square should be cut diagonally from the right bottom corner to the left top corner as pictured below. 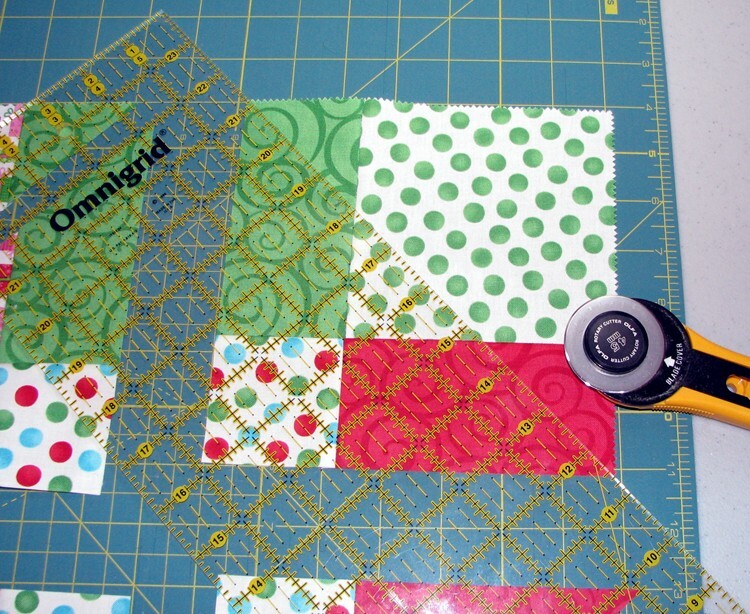 You end up with a diamond-shaped cutting pattern as below. Using the four center triangles, take one top and one bottom triangle put them right sides together and sew a 1/4 inch seam along the diagonal edge to form a square. Take the other two triangles and sew them together as well. You now have two “accidental” blocks. 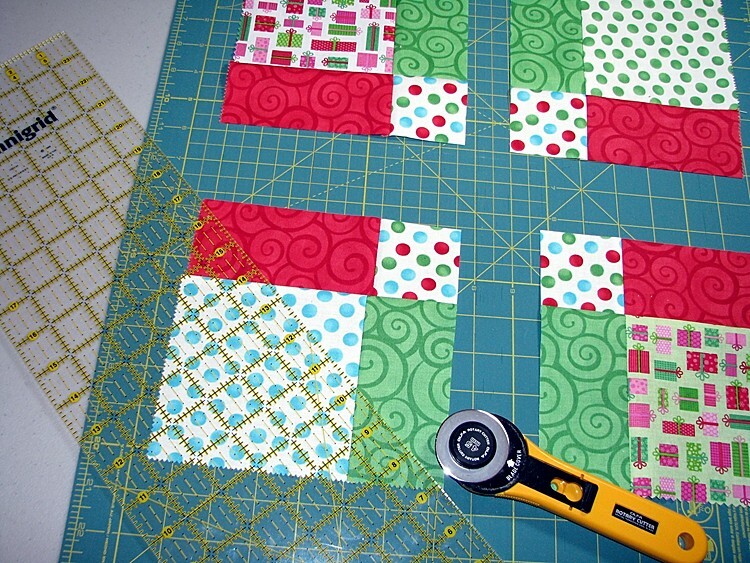 Depending on the block you desire, you can sew the triangles together in two different ways. The blocks measure about 6 1/2 inch square. There will be a couple of dog ears you should trim off before sewing your blocks together. I have taken images of these blocks and tried out the two following layouts as example quilt patterns that could result from the blocks. The “cross” one is kind of wonky due to the images not fitting together really well, but I think you get the point. 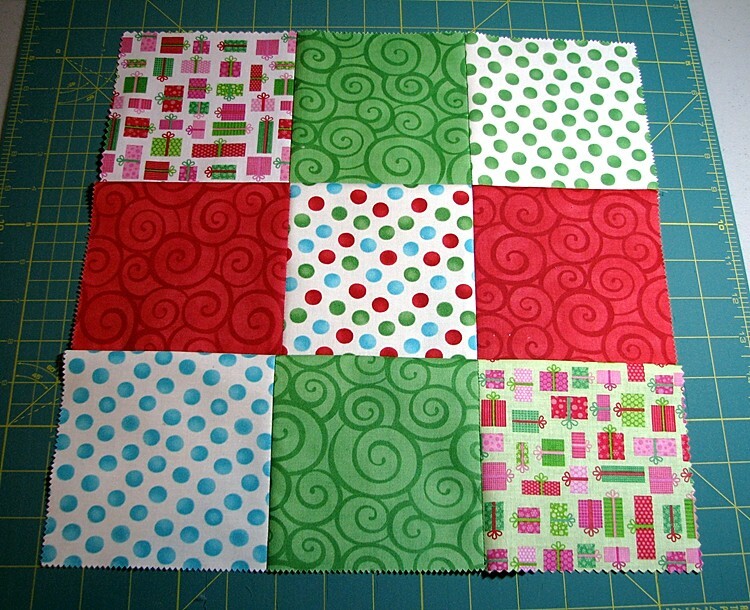 I haven’t tried combining all four examples of blocks together, but I think this shows there are several options for making quilts from blocks cut from this technique. A little more thought into the fabric chosen rather than what I just threw together might result in some really interesting quilts! If anyone makes quilts from this technique I’d love to see them. 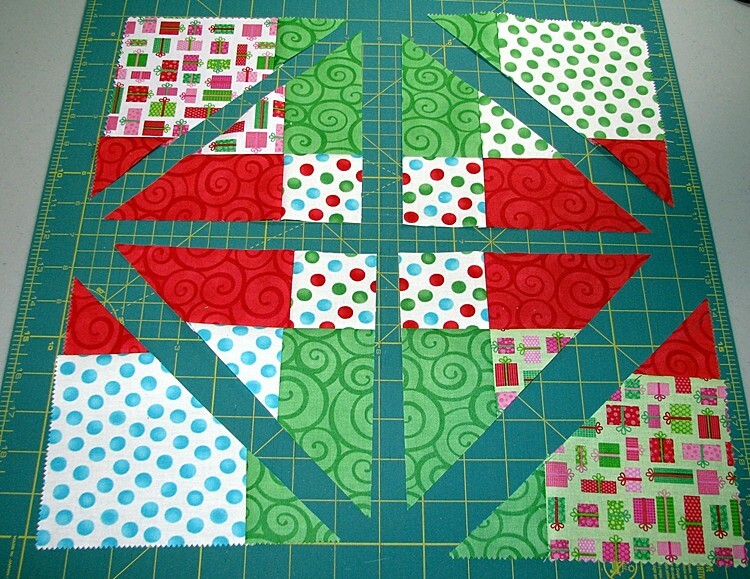 Question on disappearing 9 quilt using using block 1. I’m having problems getting the colors to match up with block 1. Can you explain how to get the part that looks like a cross to look like that. When I put mine together instead of having red and green alternating, mine has two sides alternate green and red the other two are either solid green or solid red. I have no idea what I’m doing wrong. Any assistance would be greatly appreciated. I love the way you are experimenting with the D9P. (Disappearing 9 Patch). I saw that abbreviation somewhere and loved it. I too am making a D9P quilt (2 twins actually) and it is going very fast. I think I’ll use your extra sub-cut for a couple of pillow shams! You’ve done a great job showing us how the triangles can be manipulated, Thanks for the inspiration! I love this, this will be my second quilt, my first one was just blocks sewn together, I’, excited about how you can get different looks. Thank you for sharing, love all the looks. 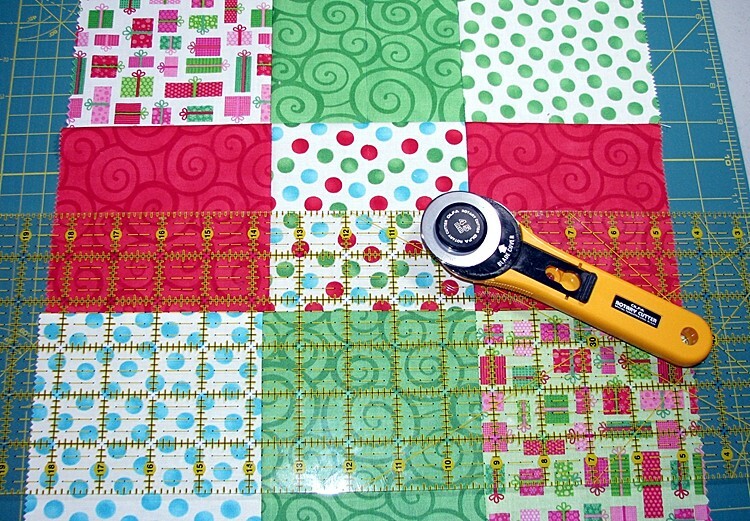 I plan on making lots of quilts with this cutting technique. I’m excited to give this a try. 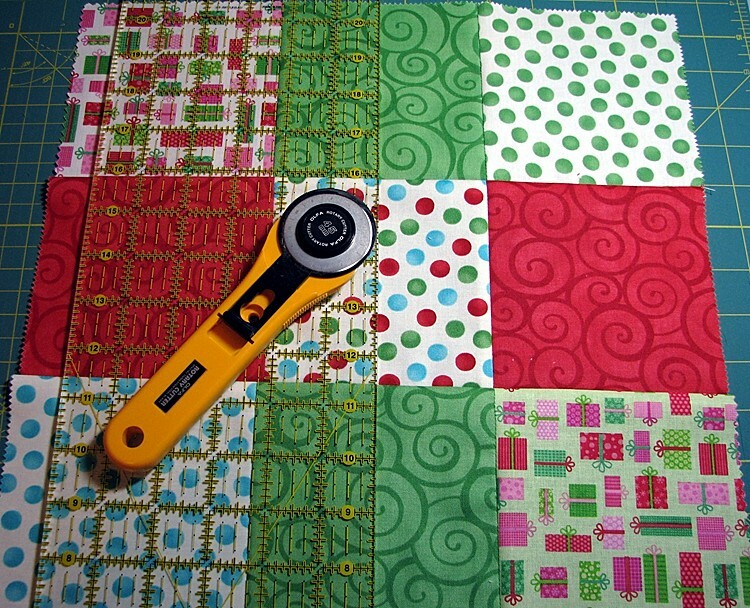 I’m going on vacation and will be looking for fabric specifically for this quilt. Thank you. 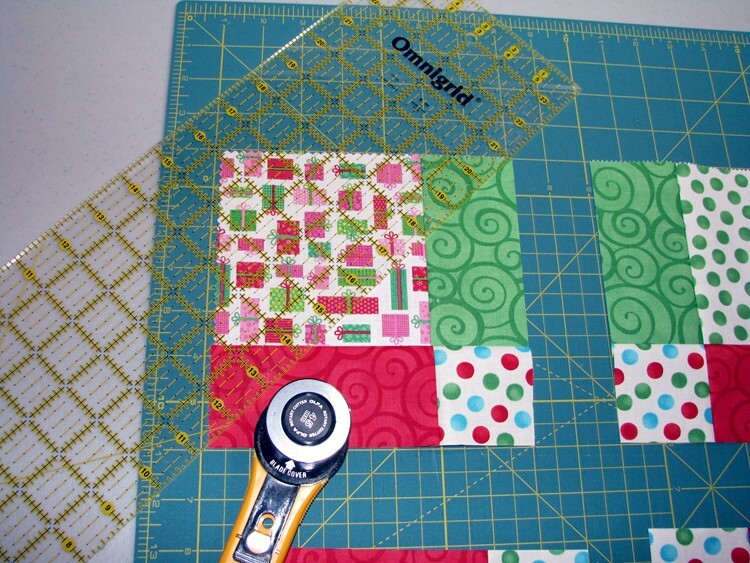 Hi,I check your blogs named “Accidental Quilt Block Tutorial- Updated | Beyond Sock Monkeys ~ My Quilting Adventures” daily.Your humoristic style is witty, keep doing what you’re doing! And you can look our website about proxy server list. Thank you! So creative and very clearly explained. Can’t wait to try these ideas! Beautiful I’ll have to give this a try! !